I read this book some time in the mid-2000s. I'm pretty sure the author's name began with R.
The main character is a (probably teenaged) boy who encounters a strange girl at his school and subsequently begins to 'disappear' from his own life. It's an effect similar to that in Neil Gaiman's Neverwhere: people look straight through him and don't realise he's there, he vanishes out of old family photos, and so on. I think his (probably younger) sister remembers him for longer than his parents or anyone else, but eventually it's only the strange girl who acknowledges his existence. She turns out to be an agent in an organisation who use time travel to sort out 'mistakes' in time. I believe her messing about to prove to him that she had time travel powers was what caused him to disappear: she went back in time to pop up in an 80-year-old photo from one of his school books, but her pushing someone else out of the photo ultimately led to a change in the course of the Second World War and the untimely death of our hero's grandfather. There's also a typical villain character: creepy and powerful, dressed in a black cape, with some ominous name like 'Midnight' or 'Darkness', he commands a swarm of gargoyle-like creatures and has the ability to stop time (he once conducts a whole conversation with our hero in between the eleventh and twelfth chimes of the clock). If I had to guess, I'd say the two main characters were called Jamie and Anna, but again I'm unsure. I've hunted around a bit online for this book but couldn't find it. Does anyone else know what book I'm talking about? After trying lots of different search terms, I took my best guess at the characters' names and blindly went ahead with Jamie, Anna, and Midnight. A Google search for "Jamie Anna time travel agents Midnight" yielded a bunch of results most of which weren't even related to sci-fi, and one which jumped out at me as soon as I saw it: Time Runners by Justin Richards. I looked it up on Wikipedia, and everything fitted exactly as I remembered it. Time Runners is a series of fantasy novels written by the British author Justin Richards. 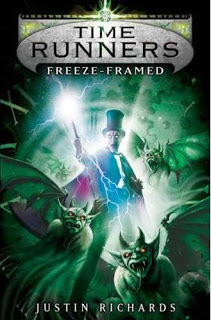 [...] The first novel Freeze-Framed was released in March 2007. The main character is a (probably teenaged) boy who [...] begins to 'disappear' from his own life. The novels are narrated in the first person by the schoolboy Jamie Grant, who at the start of the first book is twelve years old and has just started a new school. The Time Runners of the series title are people who fall through a time break and who therefore "no longer exist": they cannot be seen and are not remembered, but they continue an existence outside time, with some degree of power over it. [He] encounters a strange girl at his school [...] I think his (probably younger) sister remembers him for longer than his parents or anyone else, but eventually it's only the strange girl who acknowledges his existence. She turns out to be an agent in an organisation who use time travel to sort out 'mistakes' in time. In the first book of the series, the narrator, Jamie Grant, is introduced, along with his mum and dad and little sister Ellie. Jamie is having trouble settling at school when he meets Anna, a Runner who appears to be fourteen years old but is later revealed to have many years of experience as a Runner. [...] The Runners comprise an alliance from many places and times who work to protect time [...] with some degree of power over it. Darkling Midnight, an Adept (someone with a very powerful control over time) who the Runners see as their enemy, and who is assisted by evil time creatures called Skitters. I think I read a sneak preview of the second book, which may have had something to do with Shakespeare, but don't take my word for it. The second book of the series recounts the first mission on which Jamie and Anna are sent as Runners. They go to 1596 to prevent an assassination, and in the process meet William Shakespeare and Queen Elizabeth I.
I haven't managed to find much more about this book on the internet than what's on the Wikipedia page and the blurb from the back cover, but it's definitely the right one. Not the answer you're looking for? Browse other questions tagged story-identification time-travel or ask your own question. Book about a kid who phases out?